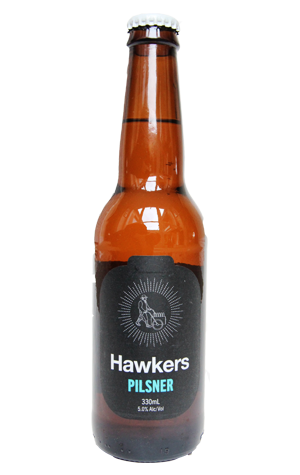 In one of our chats with the Hawkers team before they even settled on the name Hawkers, as they were mulling over what beers to launch with, one thing was certain: there would be a pilsner. The question was whether it would be a New World interpretation or something more traditional. In the end, the latter won out. The Pilsner features a collection of classic German noble hops – plenty of them – and all German pilsner malt too. The proof is there from the off, with the distinctive floral, softly spicy and herbal hop aromas combining with the soft honey like malt aromas. Gentle spices and straw like characters are followed on the palate by a broad, smooth and steadily building bitterness. The only surprise is that it registers more than 50 IBUs [international bitterness units] as you'd never guess it.